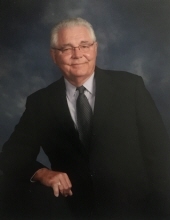 Johnny Ray Shuttlesworth, age 70 of Coldspring, Texas, passed away Thursday, February 7, 2019. He was born January 15, 1949 in Cheyenne, Wyoming to parents Guy Eugene Shuttlesworth and Verla Mae Sadler Long. He is preceded in death by his mother, Verla Long. J.R. grew up in the Waco, Texas area. He raised his family in San Antonio. Always a family man, J.R. coached his children’s soccer teams and later became a referee and started the annual Thanksgiving soccer tournament. He took an active interest in Title IX issues and helped reform and improve female athletics within the schools of N.E.I.S.D. After retirement, J.R. and his wife moved to Coldspring, Texas where he served as Worshipful Master of Masonic Lodge #37and was a member of Coldspring United Methodist Church. He enjoyed being on the lake, spending time on his boat, fishing, traveling, and being with his grandchildren. Survivors include his loving wife of 48 years, Glenda Thomas Shuttlesworth; son, Robert Eugene Shuttlesworth and wife Stephanie; daughter, Dana Michele Johnson and husband Jon; brother, William Shuttlesworth and wife LeAnn; sister, Mae Jean Klein and husband Larry; grandchildren, Halden Johnson, Matthew Schonherz, Lauren Schonherz, Elise Shuttlesworth, Lillian Johnson, Adelyn Johnson, and Harrison Shuttlesworth; numerous nieces, nephews, other relatives and friends. Visitation will be held from 5:00 p.m. - 7:00 p.m., Sunday, February 10, 2019 at Pace Stancil Funeral Home, Coldspring, Texas. Services will be held at 11:00 a.m., Monday, February 11, 2019 at Coldspring United Methodist Church, Coldspring, Texas with Dr. Dan Darby officiating. Interment will be held at 4:00 p.m., Monday, February 11, 2019 at Algoma Cemetery, Marshall, Texas. Pallbearers will be Dale Goree, Halden Johnson, Matthew Schonherz, Matt Lewis, Billy Watt, and Charlie Lombardino. To send flowers or a remembrance gift to the family of Johnny Ray "J.R." Shuttlesworth, please visit our Tribute Store. Interment will be held at 4:00 p.m., Monday, February 11, 2019 at Algoma Cemetery, Marshall, Texas. "Email Address" would like to share the life celebration of Johnny Ray "J.R." Shuttlesworth. Click on the "link" to go to share a favorite memory or leave a condolence message for the family.